General Description: It is a perennial ranging in size from 1 to 5 feet tall. Its long slender taproot can grow up to 7 feet deep. Plants begin as a basal rosette of leaves and then grow 1 to 6 branching flowering stems. Plants will exude a latex sap from injured surfaces. Flower Description: Flowerheads 1/2 inch in diameter and grow in leaf axils and stem tips, single or in clusters. Flowerheads have usually 11 (7 – 15) yellow ray flowers. Green bracts at base of flower head in a single row followed by a single row of smaller bracts. Leaf Description: Basal leaves are lobed with lobes pointing back towards the leaf base. Leaves on branching stems are few, narrow and may have entire (smooth) edges. Stem Description: Stem bases have coarse, downward pointing brown hairs and are hairless toward the tips. Stems are highly branched and have few leaves. Fruit/Seed Description: Seeds 0.1 inch (3 mm) with ribbed surface and white bristles (pappus) on one end that aid with wind dispersal. 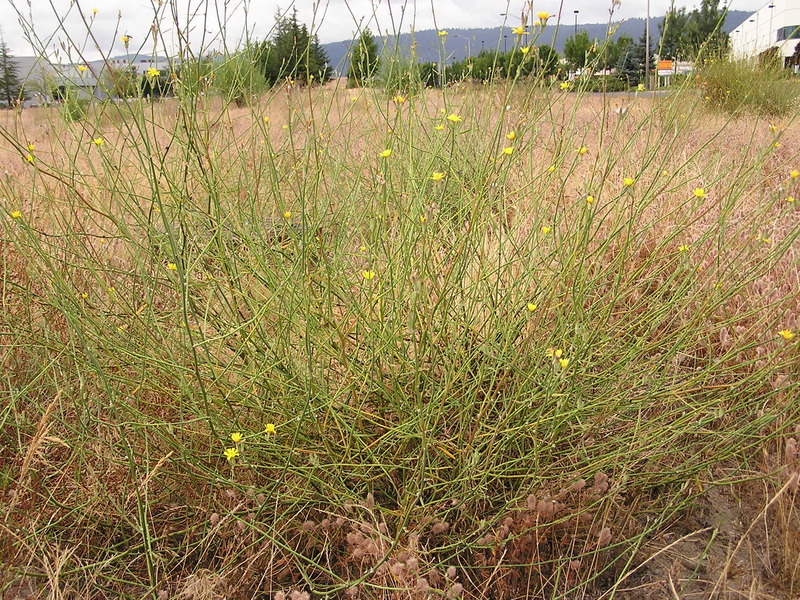 Rush skeletonweed is a threat to irrigated lands, wheat areas and rangelands. Rangeland infestations displace native and beneficial forage species grazed by livestock and wildlife.